The all new John Deere XUV825i hasn't met a task it can't handle. 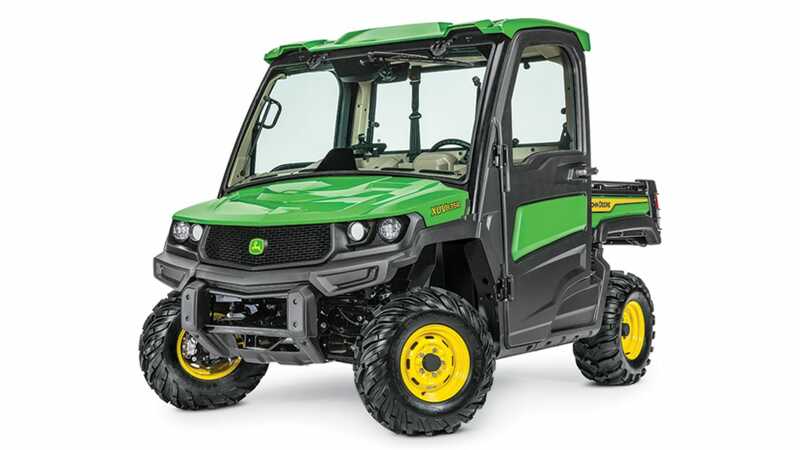 Round up your cattle, pull hedge fence posts, haul material or play in the woods -- you won't be surprised at the reliability of a John Deere Gator UTV. Equipped with power steering and an anti-kick back feature, the Gator 825i UTV won Best in Class Ride Quality. The new deluxe cargo box is easier to operate, is hard to dent and eliminates rust. Feel the adrenaline rush for yourself at our location near you in Elyria and contact us for more information or a personal quote. Or browse our full line of gator side-by-side vehicles here. You'll need more than luck when it comes to capturing your trophy buck. With a Frontier FP2204P food plot seeder pulled behind your John Deere side by side Gator, you can disk, cultivate, deposit seed, pack soil, cover and level -- all in a single pass. Haul back your prize with your dependable Gator UTV. To learn more about John Deere Gators and Frontier food plot seeders, stop by Polen Implement and talk to one of our knowledgeable sales associates. Then, take aim on a sure hunting success and bring home that trophy buck! ¹Offer valid on qualifying purchases made between 01 March 2019 to 30 April 2019. This offer is for XUV, HPX, and RSX only. Subject to approved credit on a Revolving Plan account, a service of John Deere Financial, f.s.b. For consumer use only. No down payment required. Introductory rate of 0% APR is for 36 months only, regular Revolving Plan rates will apply after that. Available at participating U.S. dealers. Prices and models may vary by dealer. Offers available on new John Deere Gator Utility Vehicles and in the U.S. only. Prices and savings in U.S. dollars. Offer valid on qualifying purchases made between 01 March 2019 to 30 April 2019. This offer is for XUV, HPX, and RSX only. Subject to approved installment credit with John Deere Financial, for consumer and ag use only. A down payment of up to 10% may be required. $27.78 per month for every $1,000 financed. 0% APR for 36 months only. Taxes, freight, setup and delivery charges could increase monthly payment. Available at participating U.S. dealers. Prices and models may vary by dealer. Offers available on new equipment and in the U.S. only. Prices and savings in U.S. dollars. Offer valid on qualifying purchases made between 01 March 2019 to 30 April 2019. Subject to approved credit on a Revolving Plan account, a service of John Deere Financial, f.s.b. For consumer use only. No down payment required. Introductory rate of 2.9% APR is for 60 months only, regular Revolving Plan rates will apply after that. Available at participating U.S. dealers. Prices and models may vary by dealer. Offers available on new John Deere Gator Utility Vehicles and in the U.S. only. Prices and savings in U.S. dollars. Offer valid on qualifying purchases made between 01 March 2019 to 30 April 2019. Subject to approved installment credit with John Deere Financial, for consumer and ag use only. A down payment of up to 10% may be required. $17.92 per month for every $1,000 financed. 2.9% APR for 60 months only. Taxes, freight, setup and delivery charges could increase monthly payment. Available at participating U.S. dealers. Prices and models may vary by dealer. Offers available on new equipment and in the U.S. only. Prices and savings in U.S. dollars.